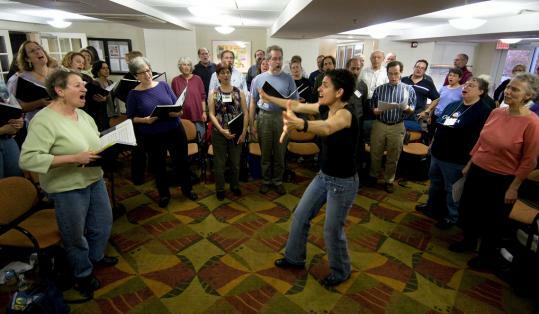 BROOKLINE – They meet every Saturday on the third floor of the Goldman Family Residence Center, 80 singers in all, to rehearse the rich four-to-six-part harmonies of Eastern Europe. Together they make up the largest Yiddish chorus in the world. STAND UP SING OUT: A BESERE VELT WITH THE KLEZMATICS At: Somerville Theatre, 55 Davis Square, Thursday at 7:30 p.m. Tickets are $35, $50, and $100 at 800-838-3006 or www.circleboston.org. Many of the songs mirror traditional Eastern European melodies, with lyrics about the labor movement, daily life, social justice, and hope. The song “Vacht Oyf” (Wake Up), for example, written by Jewish factory worker David Edelstat, calls for workers to rise up against poor working conditions. The chorus began singing in 1997 under the auspices of the Boston Workmen’s Circle, a branch of the Workmen’s Circle/Arbeter Ring, which was started in 1892 by a handful of Jewish sweatshop workers in lower Manhattan. Today the choir includes members from kids to university faculty. Thursday’s concert will honor three people who represent key elements of the Workmen’s Circle: Mark Erlich of Jamaica Plain (representing the labor movement), the executive secretary-treasurer of the New England Regional Council of Carpenters whose grandfather led an organization of Jewish workers in Eastern Europe and Russia; Sylvia Rothchild of Chestnut Hill (Jewish identity), a choir member and writer who was among the first to edit oral histories of Holocaust survivors; and Nora Guthrie (arts and culture), folk singer Woody Guthrie’s daughter. A few years ago, Nora Guthrie, a singer-songwriter who lives in New York, discovered song lyrics of her father’s that were never put to music. She approached the Klezmatics, who produced two recordings and were subsequently awarded the 2006 Grammy for best contemporary world music album. Choir member Norman Berman, 60, a Boston lawyer whose parents were Holocaust survivors, grew up speaking Yiddish with his mother. One of his favorite songs is “Vilne,” about the town in Lithuania where his mother lived. She was one of its few survivors.